This is the Realistic CD-1000 CD player that I found just this past Tuesday at Village Thrift. This is the first time I’ve found an item and posted it to the blog in the same week. When I saw this in the electronics section at Village Thrift I could tell it was pretty old from the styling, but when I saw the August 1984 manufacture date I knew I had something really special on my hands. Checking the 1985 Radio Shack catalog confirmed what I suspected: The CD-1000 is the very first CD player that Radio Shack sold. Given my already discussed fondness for Radio Shack and Realistic I had to have it. The problem was that the price was marked “3.00 As Is”. If Village says something is as-is, most likely it plain doesn’t work. But, for $3, I’m willing to take a chance. When I got it home it became apparent what the problem was: While the player would turn on, the CD drawer refused to open. I opened up the case to see if I could spot anything obviously amiss inside. The first thing I noticed was that there was a CD-R disc that must have been stuck inside the machine when it was donated that had slipped out of the drawer and was sitting among the electronics. After removing the CD-R I tried watching the CD drawer try to open with the case open. All I heard was a motor try to turn but nothing moved. Next, I took it to my father. He quickly discovered that the belt that goes between a motor and that white, round piece in the bottom center of the picture above was broken. We then proceeded to remove the drawer assembly from the unit to get a better look. 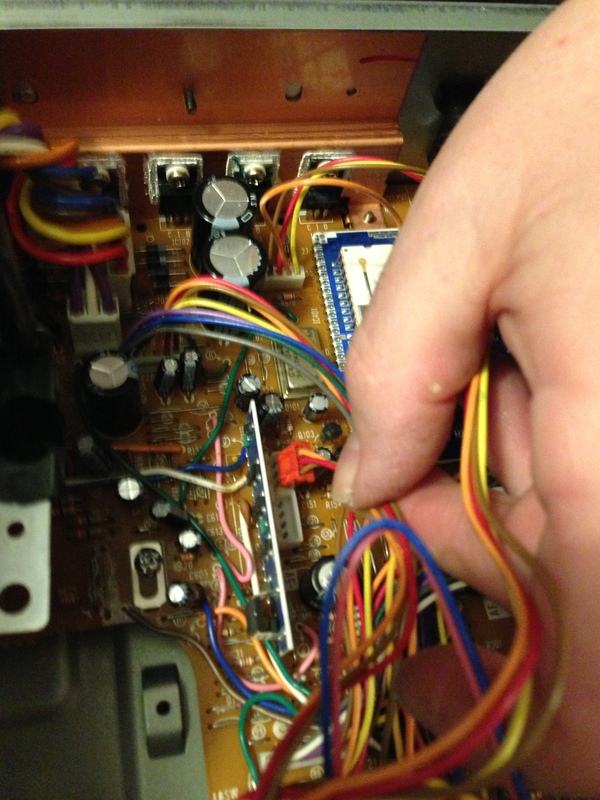 That involved unplugging all of the connections between the drawer and the main board. Eventually we got the drawer assembly out of the unit. My father manually turned the round white piece and we discovered how the drawer works. As you would expect, first the drawer pulls in. What was really curious was seeing the little platform on the center of the drawer move. See that raised platform where you place the disc? 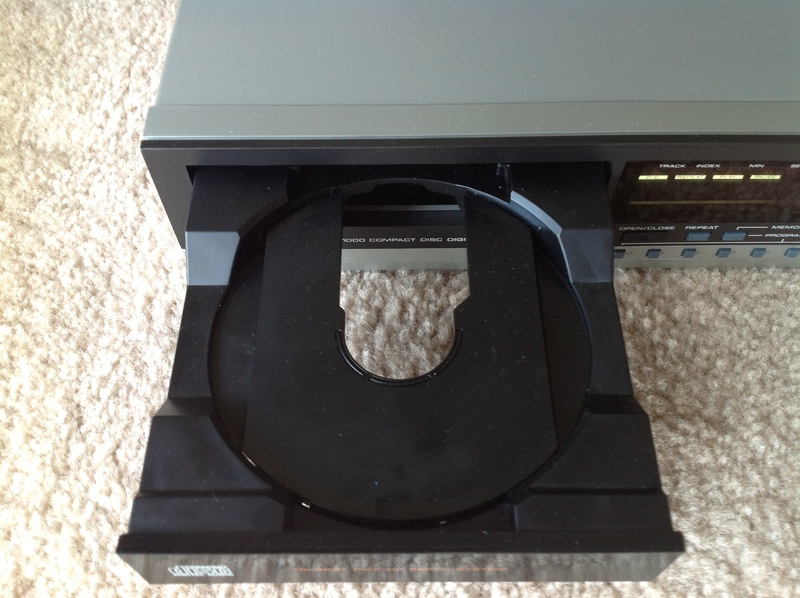 It works like an elevator that places the disc onto the drive spindle. Then the white plastic piece with the “Danger!…” sticker on it moves downward and clamps the disc in place. All of this was driven by that single white round piece with the broken belt. The next day, my father took the drive assembly to Philcap Electronics where they took some measurements and sold him a replacement belt for $3. After he installed the new belt and reconnected all of the wires the CD player worked! I’m personally somewhat shocked that nothing else was broken on this thing but that belt. In researching this unit you find people talking about problems with distorted sound and the laser failing, but my player seems to work perfectly after the belt repair. The thing about CD players that is a blessing and a curse is that to a close approximation they basically all sound the same. I had heard though, that the very earliest CD players had some nasty filtering in their early DACs that might be audible. Personally, it sounded to great to my ears. 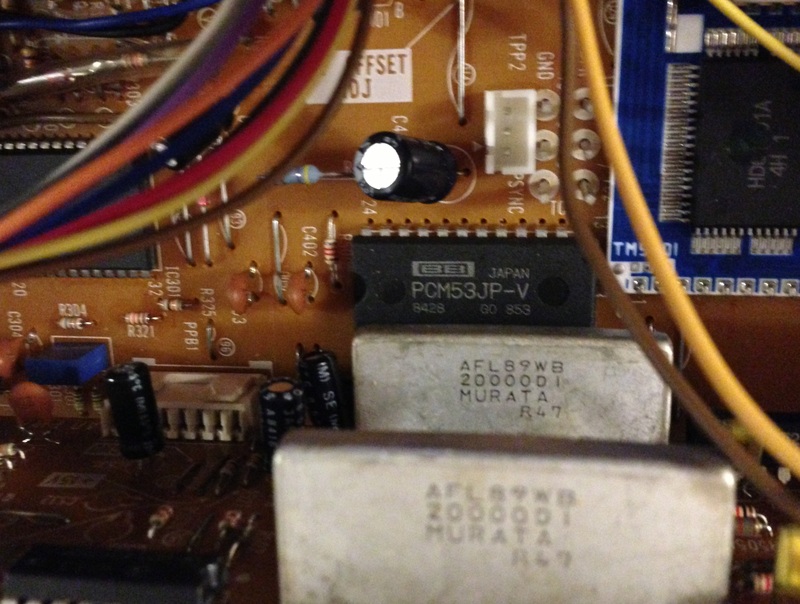 That got me curious about what all of those chips were inside the CD-1000. The first thing I found was that this player was probably designed for Tandy by Hitachi. Most of the chips inside are Hitachi chips. 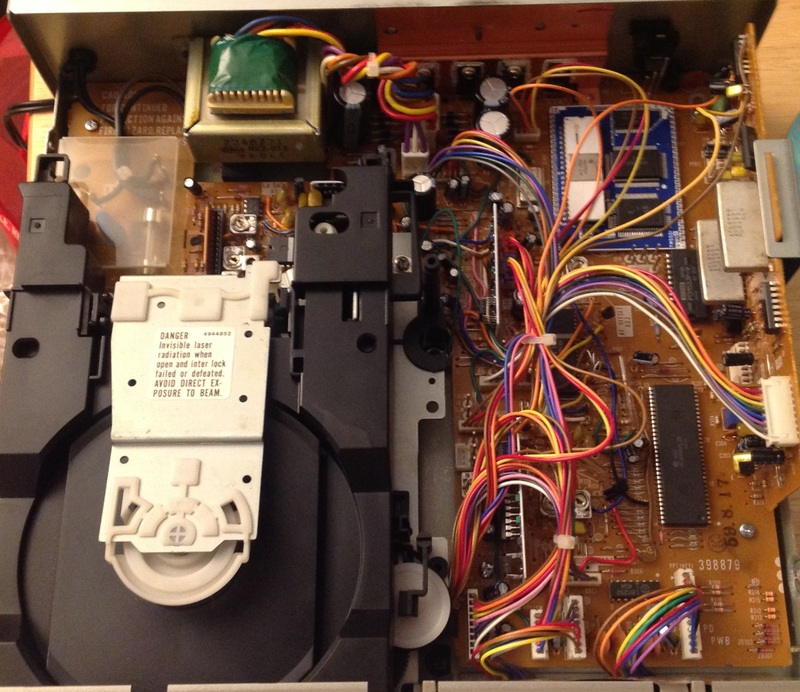 I stumbled upon this French website about another, much more flashy early CD player, the Hitachi DA-1000 that shows the chips it had inside of it. 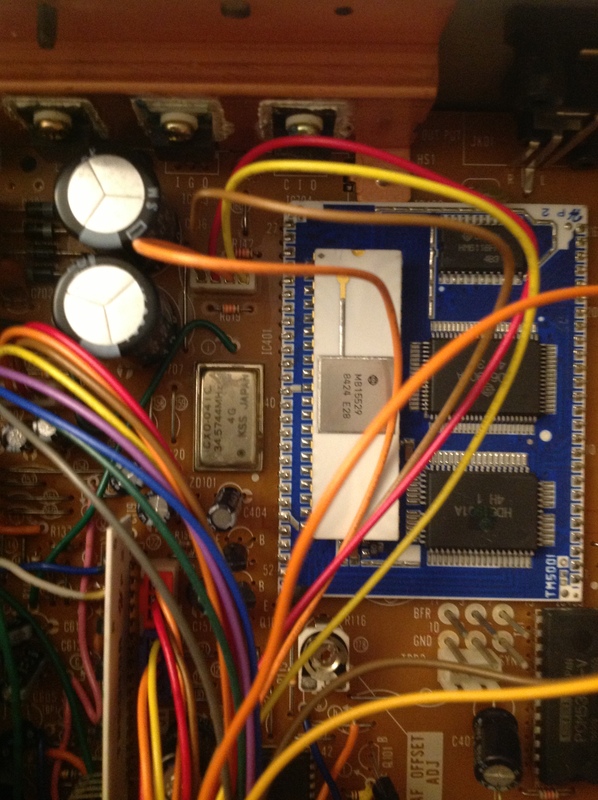 Notice that both players used the MB15529 chip. Those two other chips next to it also look similar. The description of those chips is in French, but Google Translate tells me that the MB15529 decodes the bitstream into frames and the HD60901H does error conversion. Basically, these chips are the digital portion after the drive reads the bits and before the DAC turns them into analog sound. The DAC used in the Realistic player is a 16-bit Burr Brown PCM53JP-V DAC. It sounds like this was a common chip in pro audio equipment in the 1980s. It also looks like they’re even still in demand today to repair old gear. The Burr Brown DAC is probably why this unit sounds so good today. From what I can gather the first generation of CD players like the famous Sony CDP-101 was from 1982-1983. By 1984-1985 when my CD-1000 debuted the hardware was settling down a bit. This raises an interesting point about the CD-1000. Even at the time, this was an austere player. The design was pretty low-key compared to something like that over-the-top Hitachi DA-1000 I linked to above. 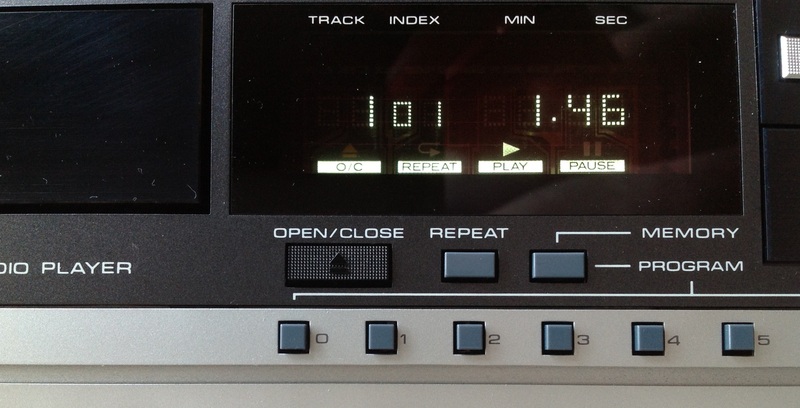 The CD-1000 had no headphone input, no remote control, and a basic (but beautiful) display. On the other hand, the CD-1000 debuted at $400 which was probably more affordable than most players at the time. And yet, Radio Shack and Hitachi did not skimp on components, since the guts look comparable to the DA-1000. It’s interesting to see how the designers of the CD-1000 dealt with things that are commonplace today. For example, there is no next track button. What you do instead is hold play and press the fast forward or rewind button to skip a track. If you just hit the fast forward or rewind buttons it seeks rather than skipping. If you want to skip to track 12 you have to hit the 1 button, then the 2 button, and then press Play. The display is a simple affair with lovely, bright florescent digits. Listening to a CD player for the first time in 1984 must have been amazing. The 1980s were a time of electronic novelties. There were portable TVs, personal computers, various type of home video like Beta, VHS and LaserDisc, huge early cellular phones, etc. But, none of them could hold a candle to the shockingly great sound of a Compact Disc. No pops, no scratches, no tape hiss. Just clean sound with amazing dynamic range. Some of the pro-CD propaganda from that era was nonsense, such as how the discs were indestructible, but the promise of clean sound was true. The Compact Disc was the ultimate 1980s novelty. Today, as people re-embrace vinyl we forget the lesson the CD player taught us: Analog is tyranny. That is to say that in analog audio there’s always some noise, always some distortion and all you can do is spend more money to minimize it. That’s awful, when you think about it. You can whine all you want about the loveliness of analog audio but what it meant was that a select few who could afford expensive hi-fi systems got to listen to great sound and everyone else got less than that. Yes, you can have a great record player that minimizes surface noise and produces spine-tingling sound, but if you can’t make it affordable and give it to the masses, what’s the point of that? So, if you walked into a Radio Shack in late 1984 and were blown away listening to a CD-1000 for the first time you were hearing not a $5000 turntable but a $400 component you were much more likely to be able to afford. I can appreciate that album artwork looks much, much better on an LP dust jacket. Fundamentally I think that’s why vinyl is coming back into fashion now. It’s the beautiful artwork. There’s also a readily understandable beauty to watching a vinyl disc spin with music coming out. But we too often forget the beauty of digital audio. It wasn’t until I watched this fantastic video from Xiph.org (YouTube link if your browser doesn’t support WebM) about the common misconceptions about how digital audio works that I realized how fortunate we are to have had the CD and 16-bit/44.1KHz PCM digital audio. The most surprising thing about the video is how Monty explains that human ears don’t really need anything better than 16/44 because 16/44 can reproduce any frequency we can hear. I had always assumed that more bits and more samples would mean better audio, but that’s not the case. Given two sampled points at a 44.1KHz sample rate there is only a single waveform that fits those points that is within the range of human hearing. The 16-bit sample depth already produces a dynamic range that exceeds the range of our ear’s sensitivity and a noise floor that is inaudible. We will never need anything greater than 16/44 with the speaker technology we possess today and the ears we will always possess. 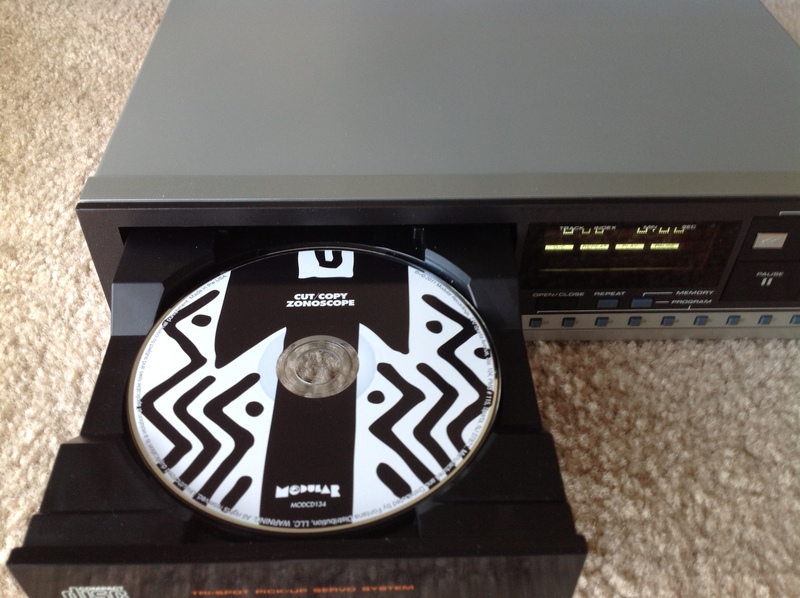 The compact disc was unwittingly the last physical consumer electronics audio format. The depth of the 16/44 format meant that there will never be another format that sounds better to most people. For playback, there’s no need to go further. More importantly though, by pressing hundreds of millions of discs full of unencrypted 16/44 PCM, the industry laid the groundwork for the future. Bits are inherently portable. Get those bits off of the CD and they can go anywhere and be physically stored in a drive of any size. What’s killing the CD now is the tyranny of space. Storing discs takes up space. Players take up space. With digital the beauty is that the music is in the bits, and not the physical medium (which is how digital defeated analog in the first place). You can make digital storage basically as small as you want. But the polycarbonate disc never matter in the first place. What mattered are the bits. And they are likely to live forever. A CD player from the 1980s with an album that badly wishes it was from the 1980s. 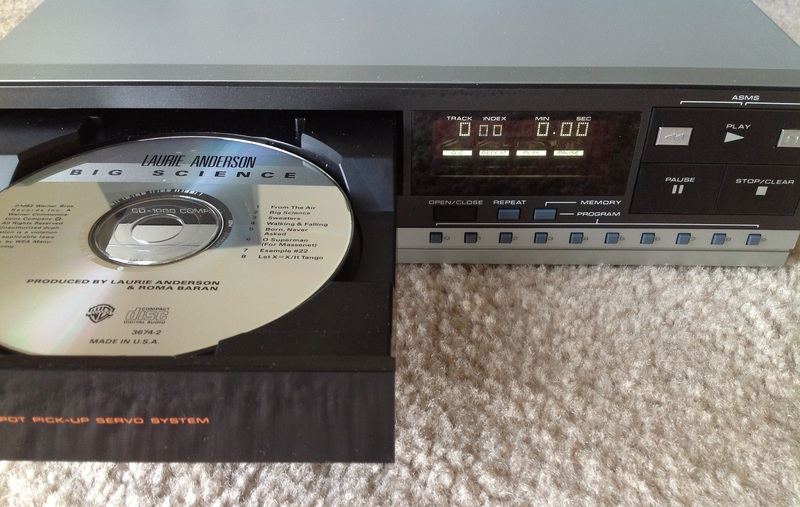 My first CD Player from 1985! I laid it away at my local NC Radio Shack and got it out of layaway by the summer! It was so cool having a CD Player back then! The sound compared to vinyl was so clean and crisp (and vinyl then was not good….1 out of every 2 or 3 Lp’s I’d purchaced came pre-warped due to too-tight shrink wrap!). Thanks for this page! 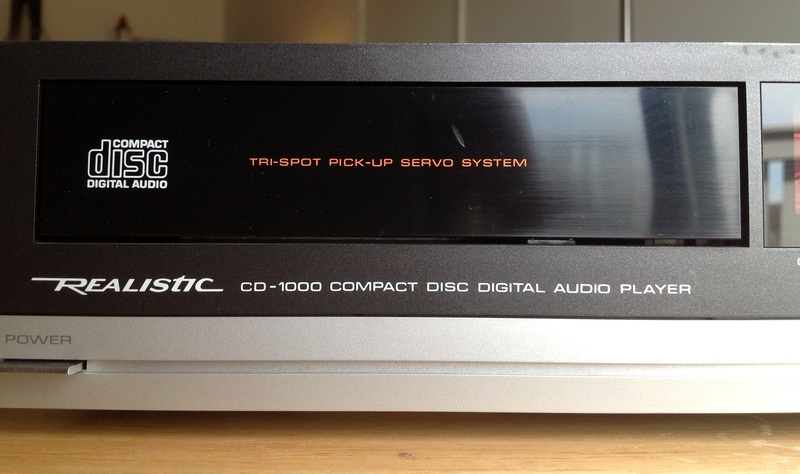 The RS CD-1000 was my CD player for about seven years until a long-ago ex girlfriend wound up with it in the early 90s. First I have to say that I like your website very much. I just got a Realistic CD-1000 from 1985, and it has exactly the same problem as yours. I’ll try to get it repair locally (I live in Miami) if I can’t not find someone to repair it, can I send it to you to do it? Please let me know and thank you very much. I almost feel sad that you did not post the part number for the belt you used to repair the CD player, my first one was the CD-1200 which my mom bought me in 1987 and it worked until my son was 3 yrs old (2001). Stupid me gave it to a friend who destroyed it and the CD player disappeared, so many great memories of that CD player and so many trips to record stores looking for what came out new as many old albums were being released to CD format. I bought in a pawn shop this cd player (realistic cd-1000) for 15$. This was something like 5 years ago. I’ve listen to it for a while and then clean it inside and out, left it for a 3 years and this morning decide to give it another try. Well everything works ok after a few minutes. I also own an Oppo 103 universel player and made some comparaison the cd 1000 isn’t up to the Oppo but it has a somewhat engaging sound in the mids that remind me of the colorfull lp playback.